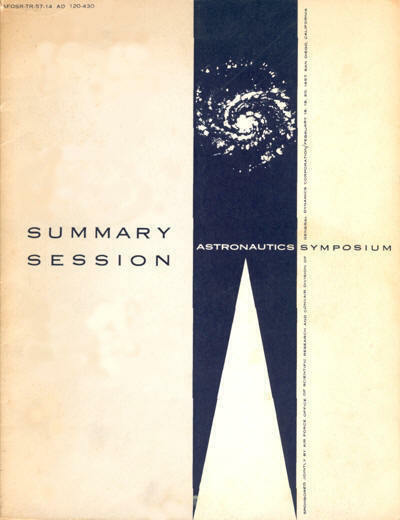 Astronautics Symposium, 18-20 February 1957. Astronautics. The Astronautics Symposium was held at San Diego, Calif., February 18 to 20, 1957, under sponsorship of the United States Air Force Office of Scientific Research (AFOSR) and Convair Division of General Dynamics Corporation. Attending were 600 scientists and engineers from armed services, independent research organizations, universities, and industrial concerns. At this first Astronautics Symposium General Bernard Schriever gave his famous speech "ICBM – A Step Toward Space Conquest" after which he was told by Secretary of Defense to never use the word "space" again. This report is a transcript of the tape recording that was made during the Summary Session on Tuesday afternoon, February 19, 1957. In each case, the panel leaders have reviewed the transcripts for technical accuracy. Only those grammatical corrections have been made which are necessary in the transition from the spoken to the written word.